Content is king. It’s a prevailing statement we’ve heard as online marketers over an over again. However, it couldn’t be truer. Content dominates as the primary reason your market likes (or dislikes) your brand. It has the power to put you from the bottom of the chain to the top-notch star in the realm of page ranks. One of the most essential components of content is curation. 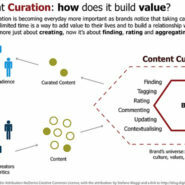 Many still find it confusing as to what content curation is and how it works. To make it as simple and straightforward, content curation is the process of sifting through myriads of content and presenting the best and most relevant ones in an organized manner. Mind you, content curation doesn’t include creating new content. It means compiling and showing them to the right market. If you’re having a hard time, then look no further. Below are expert tips for content curation, as shared by some of the industry’s finest. Courtney finished her B.A. in the University of Washington in international studies, specializing in foreign policy and diplomacy. Her experties include digital media analysis, direct sales and marketing, hotel and restaurant management, creative writing, technical writing, blogging, yoga, teaching and team building. She is currently the digital analyst of Hotel Marketing Works. Watson is best known for being the digital marketing consultant at Click To Sale. He’s worked in various marketing projects since 1994 and been heavily involved in digital marketing since 1999. Today, Watson concentrates on inbound and content marketing. The young content mogul is the content lead of Mention. Despite her busy schedule, she manages to binge on Netflix to everyone’s envy. Carter has been in the industry for quite some time now. In fact, he’s considered as one of the best. He is a 15-year digital marketing veteran and popular social media speaker, with client rosters including NBC, Microsoft, Dramamine and PrideStaff. He even runs his own company, the Brian Carter Group with world-class expertise using digital/social marketing and advertising for boosting profit. A journalist turned marketer, Mallette is he founder of Content Newsroom, a website that aids businesses in gathering new customers through quality web content.